Incorporate reliability into your projects with this high powered adjustable solid state timer. Integrated snubbing circuitry allows for switching of both resistive and inductive loads up to 10A*, and dual trim pots provide precision controlled delays from 15 seconds up to 120 minutes**. 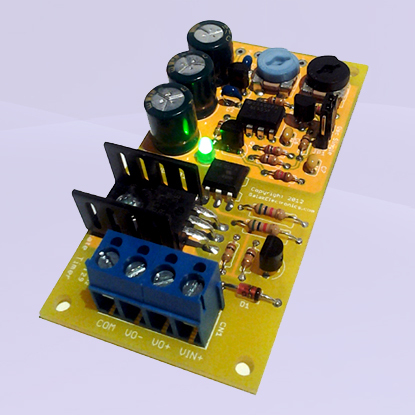 The unassembled kit includes instructions (including schematic and parts placement) and all the components to build one complete Solid State Adjustable DC Timer. A soldering iron, solder and a pair of cutters are required for assembly. User selectable time delay up to 120 minutes** with coarse and fine adjustments. Operates in either asynchronous mode or single shot with fully debounced input. 6VDC or 60VDC output at 10A max* with 4 terminal connector for easy inline integration. Wide input supply voltage from 6 to 30VDC and supply current of only 10mA with output energized. Green LED to indicate when output is active. * Maximum current rating is at 212°F (100°C) ambient. Heat sinking is required for average loads exceeding 5A. ** Standard maximum time delay is 30 minutes. Replacement capacitors (at additional cost) can be substituted for extended delays.